We feature affordable prices and specializes in one of a kind Shabby Chic Furniture and Home Decor Ideas. Our handmade, Table Lamps are embellished with the finest materials and special custom order for your specific Home Decor Chic Furniture Ideas. Shabby Chic Furniture has free of charge Decor ideas to suite your home interiors also Shabby Decorating is free of charge. We also a large selection of Cottage Wall Shelf's. Decorative Mirrors. 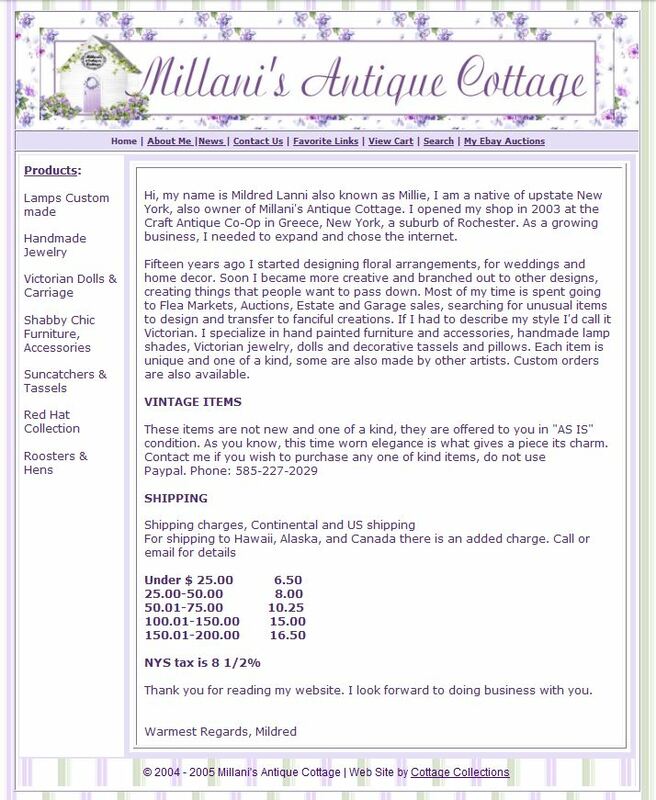 Hi, my name is Mildred Lanni also known as Millie, I am a native of upstate New York, also owner of Millani's Antique Cottage. I opened my shop in 2003 at the Craft Antique Co-Op in Greece, New York, a suburb of Rochester. As a growing business, I needed to expand and chose the internet. Fifteen years ago I started designing floral arrangements, for weddings and home decor. Soon I became more creative and branched out to other designs, creating things that people want to pass down. Most of my time is spent going to Flea Markets, Auctions, Estate and Garage sales, searching for unusual items to design and transfer to fanciful creations. If I had to describe my style I'd call it Victorian. I specialize in hand painted furniture and accessories, handmade lamp shades, Victorian jewelry, dolls and decorative tassels and pillows. Each item is unique and one of a kind, some are also made by other artists. Custom orders are also available. VINTAGE ITEMS These items are not new and one of a kind, they are offered to you in "AS IS" condition.